I recently read an article that said the average child has 10 colds a year. I have four kids! I do not have time to deal with 40 colds a year! And don't get me started on the flu! Last year we became infamous at our doctor's office because my oldest son and my youngest daughter managed to contract two different strains of the flu at the same time. Did I mention that I also had a new baby at home when it happened? That was fun with a capital F! During the week that the two of them were home sick, it was my number one goal to keep those germs from spreading to the four other people in our house. With the help of Clorox Disinfecting Wipes and a lot of hand sanitizer, I successfully kept the germs at bay and we avoided potential disaster. Since then, I have made those two tools my number one item in fighting off cold & flu viruses in my home. I have always stored a container of Clorox Disinfecting Wipes under every sink in my home for quick clean up in the bathrooms and kitchen, but this time of year I add another step to my cleaning routine. I walk around the house with the container in my hand and wipe down everything that gets touched, and I mean everything! Try it. You will be shocked at all of the places you find that germs can hide. There are the obvious spots, like door knobs and faucets, but you might forget your computer keyboard or the remote control. I use Clorox Disinfecting Wipes to wipe down the banister, wipe off the keys to our piano, the controllers to our game console, the light switches, you name it. It may sound like a lot, but it only takes a few minutes to tackle the room I am in and that is a lot less time than I would spend taking care of my kids when they are sick. I obviously can't control the germs everywhere they go, so I also make sure to do anything I can to help them build their immune systems naturally. My kids go to bed pretty early on school nights. I make sure they are eating a variety of foods, and when the weather permits, they are outside playing. The exercise isn't just good for keeping them healthy, it keeps them all happier too! This year has been a nasty one for colds and flu around here, but with the help of Clorox Disinfecting Wipes we have kept everyone healthy, even the 1-year-old that puts anything and everything in his mouth. I would love to hear your tips for keeping your kids happy and healthy this time of year, and if you want more ideas for yourself, you can check out ideas on how to prevent the spreading of germs over on the Clorox website. Now for a chance to win a $100 Visa gift card, tell me, what are your tricks and tips for a flu-free winter? Use Clorox Disinfecting Wipes as directed. This sweepstakes runs from 1/27/14 - 2/24/14. Be sure to visit the Clorox page on BlogHer.com where you can read other bloggers’ reviews and find more chances to win! love me some clorox wipes! I let the window open for a few min. everyday to let in fresh air and release all the dirty toxins building up in my house! I send my kids to school with the hand packs of germ wipes in their school bag so they can clean their hands before they eat a snack or lunch. I also use Clorox wipes at home and send them into my kid's classrooms. Unless they bring a bad cold home, I rarely get sick. I truly wish I had a useful tip, as I've had two serious colds already this season and my husband had the flu for several weeks. It was a rough December for us both. To help prevent colds and flu I like to take zinc and vitamin c, and just keep my hands clean. Staying out of large crowds and help greatly, if you can do this. We get flu shots, take a lot of vitamins and wash our hands often. Clorox rocks! I have tried to make sure my kids wash their hands as much as possible! I also make sure door knobs and light switches are always kept clean! For a flu free winter we wash our hands a lot; and with hot water for about 30 seconds at a time to ensure germs are killed. We use disinfecting wipes and wash our hands often. Our whole family takes vitamins and eats plenty of citrus for vitamin C.
A whole lot of hand washing! Eat healthy, take Vitamin C & wash your hands often! Best tip is to hand wash frequently and I do use a lot of Clorox wipes! I try to keep high traffic surfaces like door knobs and light switches wiped down, we wash our hands like maniacs and we get the shots anyway. I try to use my own pen in public, I wear my gloves a lot in public, and I wash my hands every time I get into my car. We wash our hands frequently, sanitize carts before touching and always use paper towels to touch door knobs in public places. I also sanitize my children's hands before eating or touching their faces when out. We also take vitamins to try to maintain health. Keeping any sick bug away with three little boys at home is definitely a task! I tend to wipe down door knobs more during this season and definitely make sure to change out pillow cases more frequently than I normally do. It really seems to help! 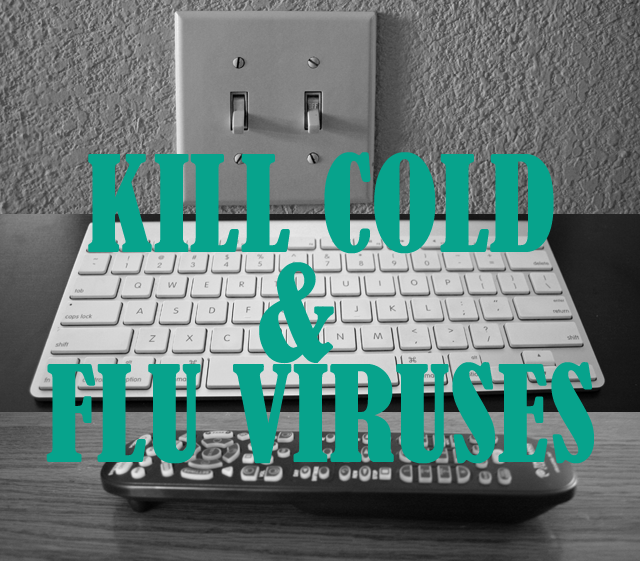 My tips to a flu-free winter is keeping the house clean. 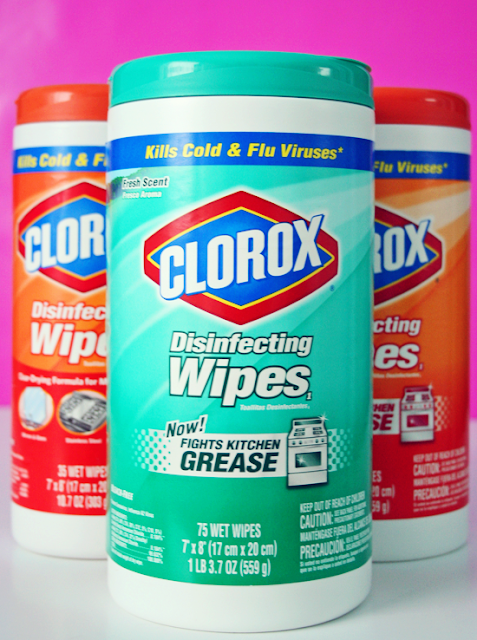 I always make sure I have Clorox wipes in stock, they are so convenience to use. I have my children wash their hands often. A flu shot is a must. My tips are an annual flu shot, plenty of sleep, eat healthy, wash hands frequently and stay away from sick people. A flu shot and lots of vitamin C! Going to bed early and drinking lots of water is how we stay healthy. Veggies and vitamins help too. We keep Clorox wipes under every sink and also in our cars. Germs need to be wiped away! We are constantly washing hands. We try and stay hydrated and I have humidifiers going in the house. I encourage and remind my kids to wash their hands often, especially when coming in from school or stores and to also wash more often if they have colds. I wash my hands a lot and eat healthy foods. Handwashing, plus keeping hands away from eyes, nose, mouth and ears. I try not to open any doors with my bare hands. If no one is there to open the door for me, I usually use part of my sleeve to open it. I also wash my hands often. I wash my hands often. I wash my hand a lot. Lots of water, sleep, vitamins and a flu shot! I wash my hands all the time as a health care professional and always wash fruits/vegetables before I eat them. Everyone washes their hands when they get home,use the bathroom, or have been cooking. I also use disenfecting wipes on the knobs, sink handles, and tv remotes! Get a flu shot, wash your hands with soap, cover your mouth when you cough/sneeze. wash their hands more often,get plenty of rest and drink plenty of liquids. I am a big believer in using vitamin C.
It's important to keep hands washed and avoid crowds. I also wipe surfaces to keep germs to a minimum. Washing hands is so important! Eating a healthy, balanced diet is too. My only trick/tip for a flu-free winter is to stay away from sick people. Thanks for the giveaway! We go for walks when the weather is nice, we wash our hands frequently, we stay hydrated, and we've all had our flu shots! We all got a flu shot, I use Clorox wipes all the time and we wash our hands frequently. Flu shots, handwashing, Kleenex (not cloth handkerchiefs) and Clorox. I make sure that everyone is current on their flu shots. We wash our hands a lot! We also try to take vitamins and eat healthy! We wash our hands as much as possible these days. I eat well, take vitamin C and get enough rest. Wash hands often and keep them away from your face. We use Lysol on our doorknobs and phones. for a flu free winter, wash your hands often and stay away from sick people! Reminding kids to wash hands and using Clorox wipes. I seldom get flu, but yeah eat healthy, have vitamin C and wash hands all the time. I stay away from crowds. I load them up with vitamin C, and I also make sure we don't run out of hand sanitizer. And I'm big on wiping doorknobs and toilet handles! I wash my hands a lot, actually I think too much. And I use Lysol wipes throughout the house. I encourage my sons to cover their mouth, when they cough or sneeze, frequent hand washing and eating lots of fresh fruits and veggies over sweets. To prevent flus, I wash my hands often and use hand sanitizer. We wash our hands a lot! We stay in a lot, best to reduce exposure as much as possible! Drink lots of water and wash your hands contantly. I make home made Chicken soup with lots of onions and garlic in it which help to boost our immune systems. I wipe down door knobs, the keyboard and anything else that is touched on a daily basis to keep the germ spreading at a minimum. I keep a pan of water simmering on the back of the stove to keep moisture in the air. we all drink lots of liquids and try to get outside as much as possible for some fresh air. Keep your hands clean and AWAY FROM YOUR FACE and keep your body healthy by eating right and getting enough sleep. I do extra cleaning and wash my hands more. Clean surfaces, keep hands washed, teach kids good hand washing techniques, daily vitamin is what we do in my home and we have been flu free. We eat right, get plenty of exercise and rest and keep hands cleaned! We make sure we stay on top of hand washing or using the antibacterial gel. I also make sure we take our vitamins daily! We encourage everyone to wash their hands frequently! I avoid contact with people who are sick. It might sound a bit extreme but I don't take my little ones out if I don't need to, specially when I know there will be large crowds. I always carry hand sanitizer and disinfecting wipes to use when needed. My main tip is frequent hand washing and I try to avoid relatives and friends who are sick. Fresh air, exercise, plenty of hand washing! And I love the Clorox wipes for door handles, etc. We keep happy and healthy by constantly washing our hands. It's all about the flu shot augmented with hand washing, hand sanitizing, changing clothes often if I have a cold (to decrease germ load) and vitamins/supplements. Stock up on Vitamin D.
Vitamin D is an essential nutrient that keeps the body functioning optimally, and especially supports the immune system. First, and most important- my whole family gets the flu vaccine. We have 5 asthmatics in my immediate family, and influenza could be a killer. I like to try to avoid crowds as much as possible during flu season. I carry hand sanitizer and wipes in my purse also. We make sure to drink lots of water, wash our hands frequently, and try to keep a clean home! I use hand sanitizer constantly. Washing hands with soap, getting plenty of sleep and drinking lots of water. Teaching children good habits from the very beginning helps keep the germs away. Clean hands, wiping down areas that are most likely to be touched by germ laden hands and keeping a healthy diet are our best tools. I always avoid visiting or coming in contact with friends and family members who have the flu. I think good hygiene and cleaning wipes help prevent the spread of germs. You should wash your hands frequently and use disinfecting wipes to kill germs off surfaces of computer keyboards, bathroom sinks, kitchen counters, door knobs, phones, remote controls, etc. It is good to carry hand sanitizer on you while you are out to help clean off germs. Money, grocery carts, and door knobs contain hundreds of germs so be sure you wash your hands or disinfect them with hand sanitizer or Clorox wipes while you are out and about. I use Lysol spray!! And a lot of it lol, especially on door handles, inside and out. I know this doesn't completely prevent it, but i believe it does help keep colds and other cooties away. My hubby works at a shipyard with a few hundred ppl a day that he gets in contact with. I've lovingly nicknamed his workplace, the petri dish! Because for years he always brought us home gifts in the form of regular colds, flus, 24 hours bugs and 48 hour bugs! Since using the lysol on all the doors and everything else (including the occasional hubby spray down when he walks through the door) we've managed to make it throughout this entire winter season, without a single bug! Everybody - wash those hands! Frequently! We have a bottle of hand sanitizer in every room of our house and I keep some in my purse as well. I also wipe stuff down with either bleach or antibacterial cleaner all the time. I also use the wipes at the grocery store to wipe down the handle of the cart. Washing hands and keeping clean. My kids wash their hands after they touch germy things. Also, i hold their hand on a escalator they do not touch the sides. I wish I had the answer for keeping the Flu away, I must be missing a step somewhere, I have gotten the Flu each of the last 2 years, which usually progresses to pneumonia or bronchitis. My tips and tricks for a flu free winter are to wash hands every chance you get with hot water and anti-bacterial soap. Avoid touching your face. Eat lots of fresh fruits and veggies and exercise to keep your immune system working! If I even feel a hint of a cold coming on, I start pumping my body and my hubby's body full of zinc. It keeps things either completely at bay or makes the illness much much less horrible. Get the flu shot, eat a healthy diet, drink plenty of liquids that contain Vitamin C, get plenty of rest, practice good hygiene and stay at home when you get the bug. Wash hands often. Drink plenty of water. Use disinfectant wipes on doorknobs. we wash our hands a lot. alo i clean door handles, phones, steering wheel etc frequently. My tips are wash your hands alot and take vitamins. We always wash our hands, always carry hand sanitizer, and I keep medicine stocked in my pantry. A lot of hand washing. I wear a mask around places that have a lot of germs. I wash my hands a lot & take vitamins!